M.M. “Jack” Frost, Vice President of Eastern Air Lines, stood in for Captain Eddie Rickenbacker, President of Eastern Air Lines, and unveiled the plaque with O’Malley. Holman briefly responded to the honor and that was followed by a prayer from Rev. Ed Gabler of the Trinity Episcopal Church, flag raising ceremonies by the color guard from Felix Poppell Post, American Legion and the national anthem by the band. 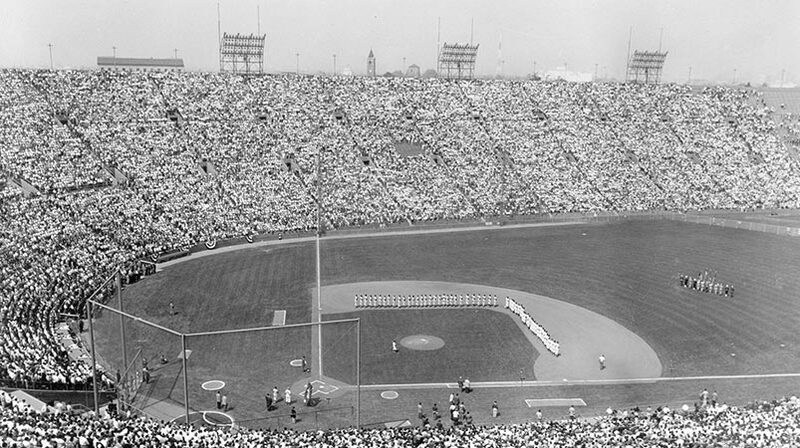 In the first game at Holman Stadium, the Dodgers defeated the Athletics, 4-2. The Athletics, with their President Connie Mack in attendance, scored the first run in the top of the first inning, but Brooklyn bounced back with three runs in the bottom of the first. Right-handed pitcher Carl Erskine allowed just one run and four hits as the starter for the Dodgers, while center fielder Duke Snider drove in two runs in a three-run first inning for Brooklyn. 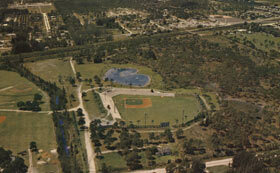 From that first game at Holman Stadium, the entire Dodgertown site received rave reviews. The experiment to build a reasonably inexpensive stadium with modern amenities, through Capt. Praeger’s design, had worked to perfection. But, for the next four years, O’Malley’s focus shifted to the important task of finding a suitable site on which to build his masterpiece, a 50,000-seat domed stadium in Brooklyn. 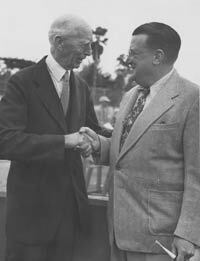 Walter O’Malley and Connie Mack, Philadelphia Athletics owner and longtime former Manager Connie Mack exchange pleasantries at the Holman Stadium dedication on March 11, 1953. The heart-shaped lake behind Holman Stadium is a tribute to Kay O’Malley from her husband. An enthusiastic baseball fan, Kay kept score of every Dodger game. 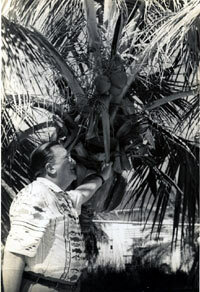 Walter O’Malley observes one of many beautiful palm trees on the Dodgertown property.